The Zodiac Pro Open 550 RIB rigid hull inflatable boat sets the standard in performance and trailerability for any recreational to Pro user. No other boat does more or can be trailered as easy as, launched and retrieved like this one. We sell the Zodiac Pro Open 550 to Police and the casual boater alike because it makes the tough stuff a piece of cake for any experiance level. With its integrated seating and console configuration, the deck arrangement has been maximized for all water activities. 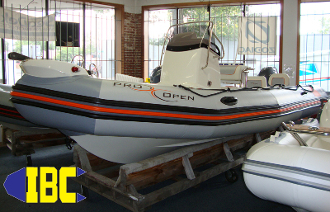 The Zodiac Pro Open 550 RIB rigid hull inflatable boat comes standard as a feature packed boat so you are ready for fun in a turn key package out of the door. Being ready to go with an integrated storage console, pedestal seating, bow box, rod holders, and additional storage for all of your gear. The Pro Open 550 is a great choice for anyone seeking endless adventure any day of the week.